If you’re building a new home in Adelaide, your laundry is probably the last room you will think about. But, considering the sizable portion of time we spend in our laundries each week—washing, drying and ironing—it is only fitting that due care and attention goes into the planning and design of this greatly-utilised, and often underthought space. The laundry is one of the smallest rooms in the house, yet it is home to cumbersome whitegoods, a large sink, an ironing board and cupboards filled with cleaning supplies, linen and towels. We expect our laundries to perform some serious feats of multitasking, so it is wise to consider how best to make this highly-utilised room work for you. Enter Hills Robes and Kitchens, Adelaide’s most trusted and recognised name in custom cabinetry. When you turn to us to help you plan your space, we contribute our expertise in clever design and storage optimisation. 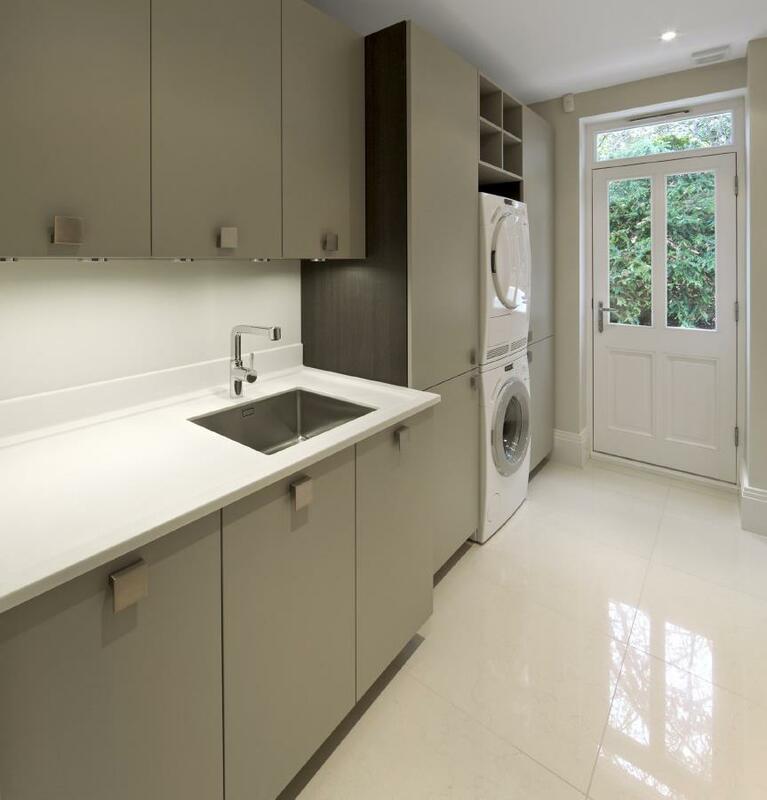 Our knowledge is underpinned by five decades of joinery and interior design experience, resulting in a functional, attractive laundry for your home. Whatever the size or shape of your laundry, Hills Robes and Kitchens can customise a storage solution wholly to your needs. Even the pokiest laundry area can house a generous storage hub with our modular cabinet designs. 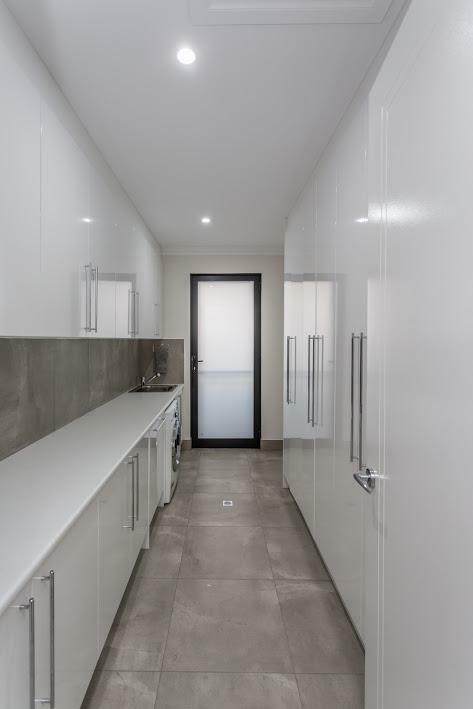 The beauty of choosing Hills Robes and Kitchens to craft your laundry is that you can choose from the same vast range of quality materials that comprise our wardrobes and kitchen cabinetry. We have curated a superior stable of product suppliers, based on our breadth of manufacturing experience. Hardy laminates and foil wraps give you unmatched water resistance in a varied colour palette. We employ 16mm thick melamine to craft cabinetry of superior strength. Achieve consistent design throughout your home with a wide variety of cabinet styles. Choose classic shaker-style doors to tie in with a traditional home, or a sleek, high-shine finish to integrate with a modern home. Choose sliding doors, or hinged, available in a plethora of colours. Our clever designs conceal your laundry essentials compactly, behind sleek cabinetry. Simply whip out as needed and stow when you are done, keeping your laundry immaculate at all times. Handle-free doors create a neat, stylish finish and the soft-close feature prevents damage caused by accidental slamming. At Hills Robes and Kitchens, we apply our decades of cabinetmaking and design practice, to the planning and construction of your laundry. Whether you’re designing a laundry design from scratch, or want to refurbish your existing laundry, Hills have the expertise to craft a stylish, spacious and functional storage solution for any room of your home, no matter its size. We pride ourselves on tailoring cabinetry solutions to our customers’ needs and budget. Call us today to arrange for your complimentary, in-home consultation and quote, and experience a detailed design and installation process that places you at the centre.